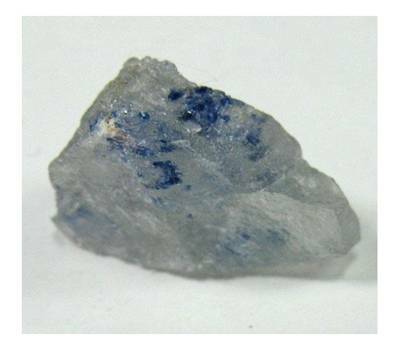 Aphthitalite is a potassium sulfate mineral with the chemical formula: (K, Na)3Na(SO4)2. 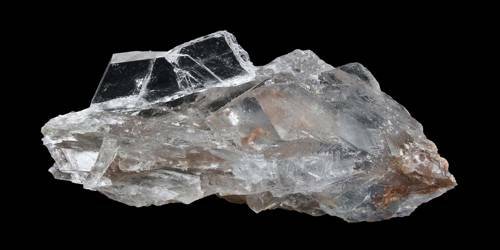 It is a mineral consisting of potassium sodium sulfate occurring massive or in white rhombohedral crystals. It was first described in 1835 for an occurrence on Mt. Vesuvius, Italy. The name is from the Greek άφθητος, “unalterable”, and άλας, “salt”, for its stability in air. Crystal class: Hexagonal scalenohedral (3m). The aphthitalite forms small, hexagonal tables, rather poorly developed, from 2 to 5 mm. in diameter, and a millimeter or less in thickness. They are rather firmly adherent to the lava by a thin layer of what appears to be the same material. The reported inversions of potassium sulfate and sodium sulfate at about 600° and 200° respectively to uniaxial (probably hexagonal) forms are of interest in this connection. It would appear to be probable that both salts are isodimorphous, the hexagonal form being that of the higher temperature. It occurs as fumarolic incrustations in volcanic environments, as small crystals and masses in evaporite deposits and in guano deposits. It occurs associated with thenardite, jarosite, sylvite, and hematite in fumaroles; with bloedite, syngenite, mirabilite, picromerite, borax, and halite in evaporites; and with syngenite, whitlockite, monetite, niter and gypsum in guano deposits.